The term Chinese sausage refers to any type of sausage originating in China, so there are many varieties and flavors of Chinese sausages available on the market. Different provinces of China produce different flavors of Chinese sausages. For example, Cantonese sausage (lap cheong), which is the most common, has a sweeter taste than Sichuan sausages, which use local Sichuan pepper and chili pepper, resulting in a very strong spicy flavor. 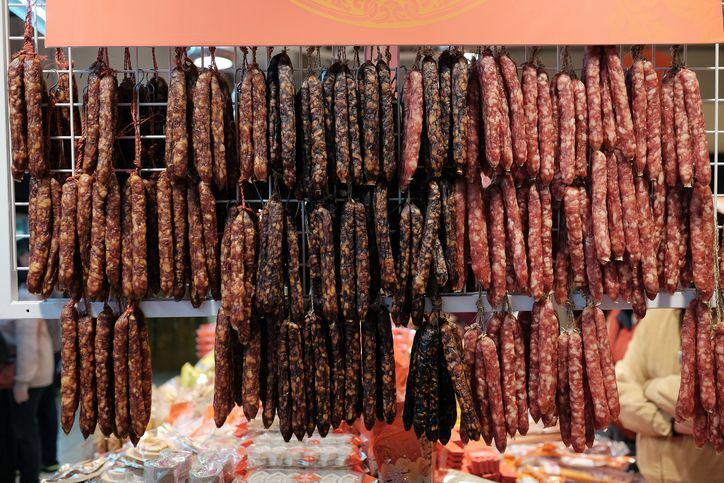 Hunan province is famous for its sausage and wax meat (or winter-cured meat, Chinese New Year pork, 臘肉). Hunan sausages have a slightly smoky taste, best described as a strong version of oak smoked bacon or pancetta. Because of the Cantonese variety's popularity, the name "lap cheong" has become a universal term for all Chinese sausage, whether sweet or spicy, fresh or smoked, or from other countries such as Thailand and Vietnam. In the U.S., however, you will mainly find two types of sausage: "bai you chang" which is flavored with soy sauce, and one made with pork and/or duck livers. No matter which type of sausage you buy, there are two basic ways they can be cooked. The most common and simple way to cook Chinese sausage is to steam it in a rice cooker with or without rice. When steaming the sausage along with rice, the rice absorbs all the delicious flavors and fat from the Chinese sausage, making it utterly delicious. You can then slice the sausage thinly and serve over the rice with some raw garlic sprouts. Alternatively, you can steam the sausage at the end of the rice's cooking time. Slice the sausage and place it on top of the rice during the last 15 minutes. Not only are these methods of cooking the sausage along with the rice convenient, but there’s also only one pot to wash afterward. If you want to steam the Chinese sausage on its own, place the links on a heatproof plate and steam, covered, over boiling water or in a rice cooker for 20 to 30 minutes or until the sausages are translucent. You can also cook the sausage in simmering water for about 12 minutes until the fat rises to the top. Another perhaps more expected method of cooking Chinese sausage is stir-frying. As you would with beef, chicken, or shrimp, you can stir-fry Chinese sausages with different kinds of vegetables, including bok choy, snow peas, mung bean sprouts, spring greens, Chinese leaves (napa cabbage), and asparagus. All you need to do is slice the Chinese sausage into thin pieces, heat up a little bit of oil in a wok, and stir-fry the Chinese sausage for one minute before adding the vegetables. Then stir-fry until everything is cooked. You can also add some chopped garlic for some extra flavor, but this is entirely up to you as the dish will already have tremendous flavor from the Chinese sausage. Two good stir-fry recipes to try are cabbage with Chinese sausage and lotus leaf wraps. You can also use Chinese sausage to make a delicious fried rice. Simply replace the meat or shrimp called for in the recipe with pieces of Chinese sausage.